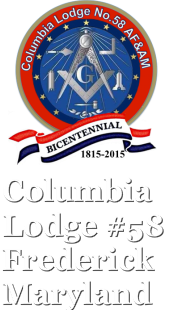 Fraternal greetings from Columbia Lodge #58, located in Frederick Maryland. We thank you for visiting our site. Please join us for fellowship; we look forward to your visit. Our Regular Communication is the first and third Monday of each month at 7:30 PM, with the exception of July and August. If Frederick County Public Schools declares a school closure for inclement weather or the Maryland State Police declare a snow emergency, lodge will be cancelled per the by-laws.